There are numerous resources available to military families that provide emotional support, financial guidance, and even discounts on products and services. As a military family are you taking advantages of all the help that is out there? Check out these 12 excellent resources compiled by Royale Scuderi, author of the Guard Wife blog. 4 Military Families – Resource portal for family members of the Air Force, Army, Coast Guard, Marine Corps, National Guard, Navy, and Reserves. Career One Stop – The Key to Career Success campaign connects military spouses, veterans and transitioning service members with high quality career planning, training, and job search resources available at local One-Stop Career Centers. Force Health Deployment Tips – The information in this section will assist service members and their families in preparing for and coping with deployments. 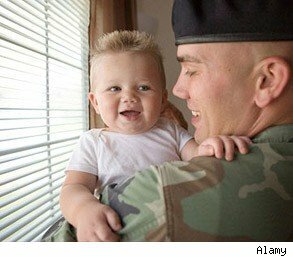 This site contains family support links for each of the services, as well as information for children, locating service members and deployment entitlements. Military Discounts – a list of common discounts that you may be eligible for. Military Connection – The Military Spouse page is proud to feature resources to help you, the military spouse, navigate through the issues that affect your daily life. Military Homefront– is the Department of Defense website for official Military Community and Family Policy Program information, policy and guidance designed to help troops and their families, leaders, and service providers. Whether you live the military lifestyle or support those who do, you'll find what you need! Military Saves – Worrying about money is no fun. If you need more financial security, join Military Saves for encouragement, support and knowledge you can trust. Military Scholar – Scholarships for military children funded awarded by military commissaries. Military SOS – Provides a comfortable, positive environment for military spouses and significant others to not only receive support, but to also vent, celebrate and come together in a place where everyone has something in common – a military significant other. Military Spot– A wide-ranging array of resources for military people. Military news, information and interactive forums allow users to actively participate, contribute and share. Military-related information is extensive, covering everything from bullets to benefits. Support Our Troops – Huge list of resources for deployed military members. Our Military Kids – Provides tangible support to children of deployed National Guard and Reserve personnel as well as to children of severely injured service members through grants for enrichment activities and tutoring.